When most of us are going to be outside for quite a while on a hot sunny day, we put sunscreen on, or at less we probably put sunscreen on our kids so they don’t get a sunburn. But what about our dogs? Can dogs get a sunburn as well? Yes, dogs can get a sunburn and dogs need sunscreen as well, if they are going to be in the sun for a long extended period of time. Taking your dog boating, to the beach, camping or an outdoor party? Your dog needs protection from the sun. Dogs can also get skin cancer, and protecting them with a sunscreen can help against skin cancer. Most dogs have fur on them covering most of their body, but there are some areas that are more sensitive to the sun and could cause your dog a nasty sunburn the same way that people experience a sunburn. 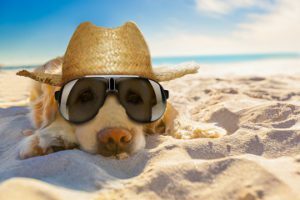 Dogs are most likely to get sunburned on their nose, the interior of their ears if exposed, belly since the fur is thinner, groin area and the pads of their feet. Anywhere that you can find pinkish skin on your dog is an area that is at risk of getting sunburned. 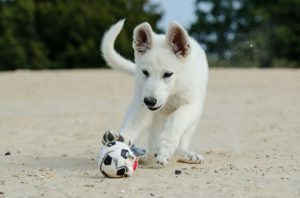 White dogs also tend to burn easier, since they tend to have fairer skin under their fur. Dogs that have thin fur or dogs that may have an area exposed from prior hot spots or from chewing their paws due to allergies will also be at risk in the areas that they have less fur. Bulldogs are also at a higher risk, since many times they tend to like to sleep on their backs, and if they are laying in the sun sleeping, their exposed belly is at risk. If you are going to be outside on a sunny day for an extended period of time, provide your dog with some type of shade. Bring an umbrella along to the beach, look for areas with trees to provide shade, or get them under some type of roof or sun shade to get them out of the sun. 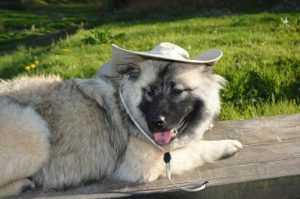 If your dog allows it, you can put a white T-shirt on your dog or even a hat to protect the ears. Many times pet owners will get their dog a haircut in the summer to help keep them cooler, but you should never have your long haired dog with an undercoat shaved. Their fur protects them. You can keep them cooler by regularly using an undercoat rake that gets rid of dead hairs. 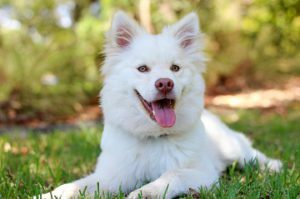 Their undercoat is designed to keep them warmer in the winter and cooler in the summer if the coat is kept healthy by regular brushing. You should apply sunscreen on your dog if they are going to be in the sun for a longer period of time. The only areas to apply sunscreen would be the exposed areas or the pinkish areas. You don’t need to apply sunscreen to areas with thick fur. They will be protected enough by their fur. Get a sunscreen that is designed specifically for dogs. If you are in a pinch, you could use sunscreen that is safe for babies or sensitive skin. Many sunscreens are made with zinc oxide. Never use any sunscreen on your dog or cat that has zinc oxide. It is toxic to dogs if they ingest it. After you apply sunscreen on your dog, have them stay by you for a bit, just to let the sunscreen absorb into their skin before the try licking it off or rolling around to get rid of it. If you are looking to get your dog some sunscreen my #1 recommendation of dog sunscreen would be Epi-Pet Sun Protector Spray For Pets. It is a non-greasy and non oily solution, the only FDA Compliant Pet Sunscreen. It is safe for dogs and horses (sorry, not cats). Epi-Pet protects your dog from UVA/UVB Rays. It is a quick dry formulation and water resistant. If you are looking for another option for dog sunscreen, I would also recommend Warren London – Premium Dog Sunscreen With Natural Aloe Vera Moisturizer. This also comes in a spray bottle and protects against UV Rays. It dries in seconds and is non oily and lick safe once it is dry. It is waterproof and the Aloe Vera moisturizer helps your dog with dry skin. I would recommend reapplying sunscreen to your dog every 2 to 4 hours, especially if they went for a long swim. A dogs sunburn can be just as painful for them as it is for us. That is why we need to protect our dogs from the sun. This dog’s ears are at risk of getting sunburned since the interior is exposed. Here is what to look for on a sunburned dog. Red skin that is tender when touched. Blisters that will eventually peel. Your dog can get a fever if their sunburn is severe. The tips of the ears can dry out and the edges curl. If this happens, go see your veterinarian. Apply Aloe Vera gel to the sunburned areas. This will help cool it. You can even use the Aloe Vera straight from a plant if you have one. Using Witch Hazel will help cool the burn as well. It is available in most grocery stores or pet stores. Dab with a cotton ball 3 to 4 times per day to soothe the burn. As it evaporates, it will help to cool the skin. Use a vitamin E pill. If you have vitamin E available, just poke a hole in the capsule and squeeze the liquid directly on the sunburned area. It will help to heal the burn and help keep it moisturized. You can apply a cool wet cloth to the area as well, to help reduce the amount of heat on the skin. The answers to can dogs get a sunburn and do dogs need sunscreen is yes to both. We need to protect our dogs in any area that is pinkish from UVA Rays the same way we need protection. It seems that as dogs get a bit older, they really like laying out in the sun for longer periods. I think that maybe it feels good on their old bodies. Keep an eye on a dog laying in the sun. Generally your dog will be fine up to 30 minutes, but if they are going to be in the sun longer, get some sun protection on them. Try to provide your dog with plenty of shade on hot sunny days and always make sure that they have plenty of water when they are outside. If you haven’t previously used sunscreen on your dog, you should start. If you already are, good for you.